The only place online to buy personally-signed CDs, DVDs and books by Richard Barone, along with exclusive t-shirts and other cool stuff. 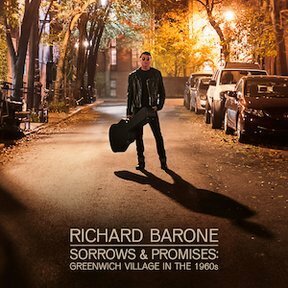 Richard Barone is an acclaimed recording artist, performer, producer, and author. Since pioneering the indie rock scene in Hoboken, NJ as frontman for The Bongos, and reinventing himself with the chamber pop classic “cool blue halo”, Barone has produced countless studio recordings and worked with artists in every genre. Collaborators have included Tony Visconti, Beach Boy Al Jardine, Sean Lennon, Dion, John Sebastian, Alejandro Escovedo, Jill Sobule, Donovan, Moby, the late Lou Reed, and American folk icon Pete Seeger. He has scored shows and staged all-star concert events at such venues as Carnegie Hall and the Hollywood Bowl. His memoir Frontman: Surviving The Rock Star Myth was published by Hal Leonard Books. Recent album releases include his studio album, Glow produced by Visconti, the deluxe CD/DVD set, '”cool blue halo' 25th Anniversary Concert”, and his latest, “Sorrows & Promises”, a new album of songs from the early 1960s music scene in Greenwich Village, where Barone lives. He is affiliated with the Clive Davis Institute of Recorded Music at New York University and The New School of Jazz of Contemporary Music, where he teaches "MUSIC + REVOLUTION: Greenwich Village in the 1960s".